Here’s a post from the AMSAT-UK high altitude balloon blog. It’s a great story about a balloon cruising at about 12km above the Earth completing its sixth circumnavigation of the planet. That post is from October 4th, and two weeks later the balloon is still going strong. Right now it’s over the Baltic heading into Russia with no sign of stopping or popping any time soon. The balloon was launched July 12, 2014 from Silverstone, UK. In the 100 days since then, this balloon has covered 144168 kilometers and has crossed its launching longitude six times. 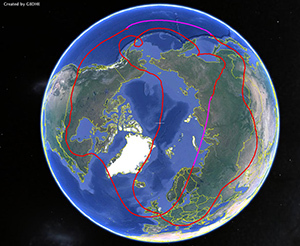 Even if this balloon weren’t trapped at high latitudes (including coming within 9 km of the pole), this balloon has still travelled more than three times the equatorial circumference of the Earth. The balloon was built by [Leo Bodnar] a.k.a. [M0XER] with a self-made plastic foil envelope. The solar-powered payload weighs only 11 grams. It’s an exceptional accomplishment and one that has smashed all the amateur high altitude balloon distance records we can find.